Thoughts from a Traveling Tech: Then why post the sign? Then why post the sign? I am always looking for the ironic in life. Sometimes it's a phrase, sometimes it is someone's actions, but most often it is a sign that just goes against the thing it is talking about. Here is a great example. I was walking back to my hotel a while back and saw the following sign on a door for a dumpster shelter. It has a slide bolt to allow the door to be held open or closed. If you have ever had to take trash out to one of these you can certainly understand the desire for one of these. 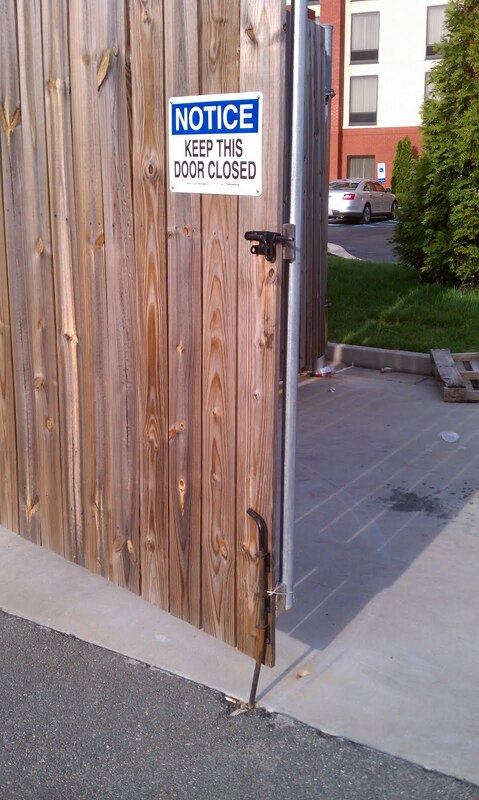 Then why put a hole in the ground for me to lock it open? After all, the sign tells me not to open the door, right?